With the sun shining until 9 p.m. everyone knows today is the summer solstice. But if it weren’t for Bug Girl, I wouldn’t have noticed that today is the first day of National Pollinator Week. How did I miss that? So what shall I do to celebrate? Last year I committed doggerel. This year, I ask you to consider helping the native bees. Honeybees get all the press. Bumblebees are easy to see. Native bees are generally smaller and more solitary. You have to pause and watch to even see them. There are bees looking for flowers from spring to fall. Modern, doubled-up varieties with no aroma look beautiful, but they give nothing to the bees. 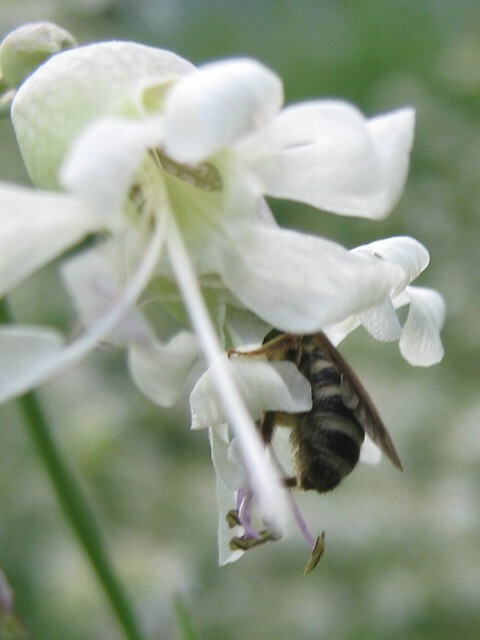 They like fragrant, single-petaled flowers that offer lots of easy accessed pollen and honey. Native plants are ideal, because native bees are adapted to them. This includes the uninvited “weed”. A weed becomes a wildflower when you let it feed the bees. Bees are insects, too. Native bees, which are easily overlooked, are vulnerable to pesticides. Besides, if you kill all the aphids, what will the ladybugs eat? Most native bees are solitary bees, who dig nests in the ground. They usually prefer sunny slopes and bare spots in the lawn. If you see little brown bees hunting about near the ground, leave them alone. It may take time for the native bees to show up. Some only appear for short times once a year. Doing these three things will make a good place for the honeybees, too. The native bees will follow.